Nassau County Legislator Joshua Lafazan (left) with Ken and Sheri Corey, parents of Brooke Corey, a chronically ill two-year-old child. Oyster Bay, NY - November 2, 2018 - More than $30,000 was raised to support a chronically ill 2-year-old child and her family during a Monday, Oct. 29 fundraiser that was co-hosted by Nassau County Legislator Joshua Lafazan (Woodbury) at the Oyster Bay Brewing Company. Legislator Lafazan became involved after hearing the story of Brooke Corey, a two-year-old Mill Neck resident who has gone from being an active toddler to chronically ill in the span of just a few months. Since then, she has undergone a battery of blood tests, MRIs, X-rays and bone biopsies in an effort to pinpoint a diagnosis. 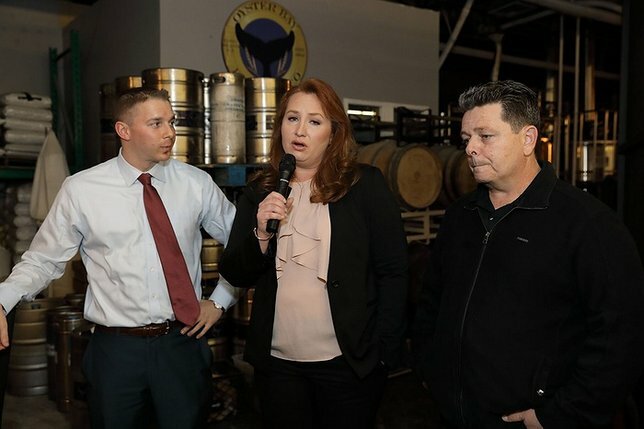 The hundreds of supporters in attendance included Brooke’s parents, Ken and Sheri Corey, and leaders of the Oyster Bay Chamber of Commerce and Oyster Bay Civic Association among others. The Oyster Bay Brewing Company donated the venue, bartenders and the entire bar tab for the evening’s fundraiser, and food was provided by the Coach Grill and Tavern and Spinnakers Restaurant and Bar. Subject: LongIsland.com - Your Name sent you Article details of "Legislator Lafazan Thanks Oyster Bay Community for Overwhelming Support of Fundraiser for Chronically Ill Child"